I think music is one of the most important part of the wedding day and I can be reliable and helpful DJ for your wedding celebration. 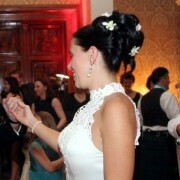 I work for lots of international clients and wedding music has been my specialisation since 2000. 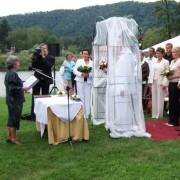 Let´s your wedding day is the most wonderful day in your common life and the beginning of amazing marriage. You can rely on a pleasant sound and appropriate volume. We have really professional, mobile and latest technics. We are able to make a sound and lights in more rooms, gardens or terraces. Color static lights (PAR 56 + stands) and special effects (moving heads) are included. You can have professional wireless microphone on stand for your speach. More than 1.000 original CDs are available (since 50s to present). Just choose your favorite styles of music! 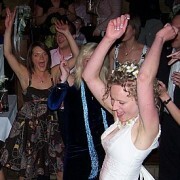 Try karaoke and have fun on your wedding karaoke party! Equipment, large screen and more than 500 popular songs are waiting for you! 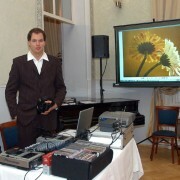 You can present photos from the wedding ceremony or old one from childhood, schooldays, holidays and so on. The price is only 950 CZK, including projector, notebook and screen. We recommand you this type of fun! The final price depends on concrete order and place. Usual price (service + equipment + transport) is 7000 CZK. Just contact me on djkuba@djkuba.cz and I will send you an offer. Thank you.